Meet turmeric – your new super spice, new anti-inflammatory power house BFF! This Southeast Asian spice is so much more than just an Indian curry ingredient. It has powerful health benefits you should know. You may not be using it daily—in your food and diet, BUT YOU SHOULD. Turmeric has been used for thousands of years in Indian Ayurvedic medicine as an antiseptic and antibacterial agent to treat infection, inflammation, wound healing and poor digestion. It’s kind of a magic food—cures lots of ails. We love raw turmeric inside The GEM for its anti-cancer and anti-inflammatory properties. Turmeric contains polyphenols that act as powerful anti-oxidants. This super spice does LOTS for your health. Let’s just start with the biggest one for me: It has badass cancer fighting properties, and has been shown to inhibit growth of various cancer cells including: breast and prostate cancers and melanoma among others. So, why add it into your daily life? Manages pain. It’s a super potent Anti-Inflammatory, it’s called “Nature’s Advil” for a reason. Perfect treatment for arthritis, joint pain, even headaches. SO many people swear by it as a remedy for inflammation! Protects the brain, prevents the progression of Alzheimers. Helps lower blood sugar and reverse insulin resistance. This is a weapon in the fight with diabetes and weight loss. Boosts immunity. With its anti-viral and anti-fungal properties, along with the inflammation component, this power house is top of the list for staying well. Reduces oxidative stress, which, among other things, contributes to high cholesterol. Because curcumin (one of three potent polyphenols found in this spice) is poorly absorbed into the bloodstream, black pepper and healthy fat should be added to increase its bioavailabilty. That being said, if you are using raw turmeric (not dried powder) like we have at The GEM, you don’t have to add anything to enhance bioavailability. Its natural oil boosts absorption. Pretty cool! The powdered version loses much of its bioavailabilty in the processing. Shoot it. Shots of turmeric are one of the quickest ways to consume to get your daily dose of anti-inflammatory goodness. Shoot it straight up or throw back a GEM Immunity Shot — with lemon and ginger for an added punch to the system. Boost it. Add to your Green Juice. Add turmeric juice for a bold move into a healthy day. Sip it. Make a tea including ginger and raw honey. 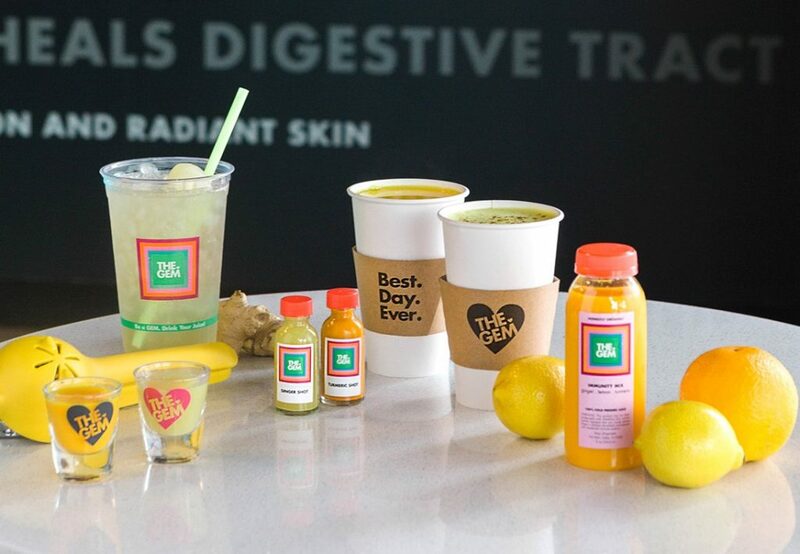 Our Amazing Hot Immunity Tea or Immunity Iced Green Tea might change your life. Make a Latte. Yep! I dare you to try this yumminess called a Turmeric Latte. Fresh turmeric, frothed house-made cashew milk and garam masala (an Indian combo with cinnamon, cloves, cardamom). Pop it. New Chapter’s Herbal Detoxification capsules are a great addition into your supplement routine. This one includes green tea extract, ginger and peppermint. All amazing immune boosters in their own right. It is important to note that like most therapeutic herbs, turmeric is not appropriate for everyone. It is a natural blood thinner, so avoid taking it if you are on prescribed blood thinners. It also might upset your stomach if you are taking medication for ulcers or heartburn (though turmeric aids in the healing of these things!). Consult your physician before use if you have any of these conditions. Want to learn more ways to boost your immunity? Join us Wednesday, September 28, 11:30 a.m., at the Forest location for our continuing education workshop called Eat for Immunity. 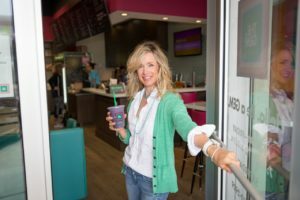 Learn what nutrient dense foods are best, how certain supplements can help and what other environmental factors can contribute to a super-powered immune system. Click here to register or call us at (214) 750-2929. Email works too! Send us a note at info@insidethegem.com. This entry was posted in Food Secrets, Health, Organic, Stress and tagged Anti-inflammatory, blood sugar, brain health, Dallas juice bar, diabetes, food secrets, Health, healthy eating, high cholesterol, Hot Immunity Tea, immune system, immunity, Immunity Iced Green Tea, New Chapter’s Herbal Detoxification, stomach ulcers, The Gem, Turmeric, weight loss on September 21, 2016 by diamondsonyourinside.